← More Art on the Lawn Photos! My apologies for those who have been waiting for the results of last week’s MRI. I had no time to process things as my mind last week was so “go-go-go” for the art festival. I just quickly dismissed everything in my mind that got in the way. This week has been different: lots of rest and lots of thinking. Plus a lot of different emotions–a bit of fear, a bit of frustration, a bit of anger, a bit of laughs, a bit of peace, a bit of hope. For the beginning of this week, it was the negative emotions. I guess I could blame it on lack of sleep, but I think I just finally started to process from last week’s appointments. There is still much to process and pray about, but after many good cries earlier this week…I feel refreshed for the continuing journey. Still doesn’t make the road ahead an easy one, but I know God will help me through it day by day. So, there is some good news from last week: my blood clot is all gone [except just a little small spot], but I “graduated” from blood thinner pills!!!! Yay! No more finger pokes for blood counts, no more nasty tasting pills! I am still to wear the compression stocking for a while (ok, like a whole one more year!! ), but we are looking into ones that are almost accommodated (to borrow the term)–meaning different ones from other companies so that I can start to put it on myself. Eventually leading to the hopes that I can move back into an apartment at some point. 🙂 That is exciting! Also, praise: the MRI scans for the brain show no growth! My doctor said that surprised him really; He was expecting a few different turnouts. Just goes to show there is no predictions in this disease. Oh wait. I take that back. I predicted that they would want me to start Occupational Therapy for my hands (especially my left hand). I was right. But I was expecting it, so I was not upset about it. In the long run, it is a good thing. Anyway, yes, I did start OT. My first session was on Wednesday. Mom and I ventured down to the Liberty Children’s Hospital for a late night session. It went well. Better than I was expecting. The main issue is trying to strengthen what muscles I have left–trying to preserve it as long as possible. Since April, I noticed more weakness. Typical I thought, until my left ring finger started to curve in. I noticed that the first part of July. 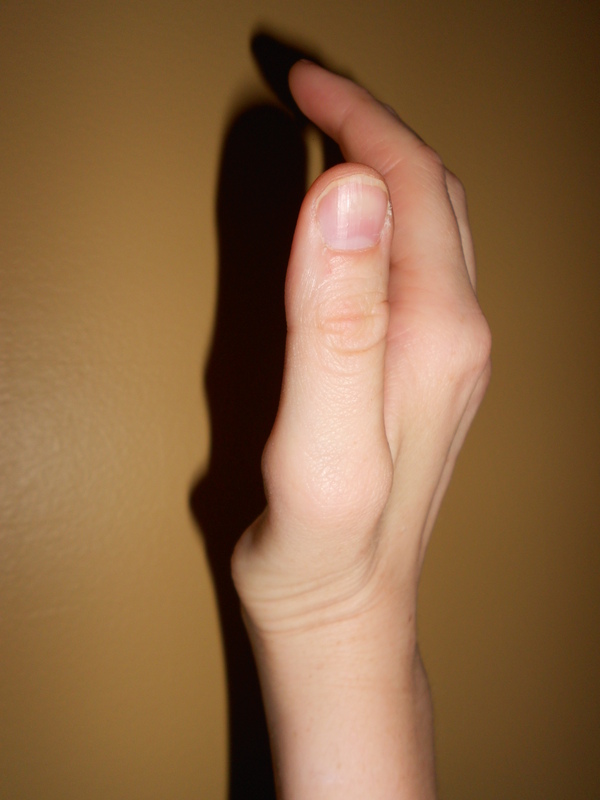 Here is the anatomy of my left hand. Notice the muscle atrophy of the palm and how my bone at the bottom of my hand by the wrist stands out. My thumbs are also like this. The muscle stops receiving the messages from the brain to function, due to the tumor wrapped around the nerve that coordinates with the area. The tumor wraps around the nerve, cutting off the messages and thus, atrophy. I think I would have found anatomy class interesting. Now I regret not taking the course in high school or college. Anyway, also, notice the ring finger. This is the position that it is in at all times. I had already been doing some “therapy” exercises on my own such as trying to play scales on the piano. Just keeping it stretched out and moving. There is nothing to do about the numbness, just mostly keeping them moving. 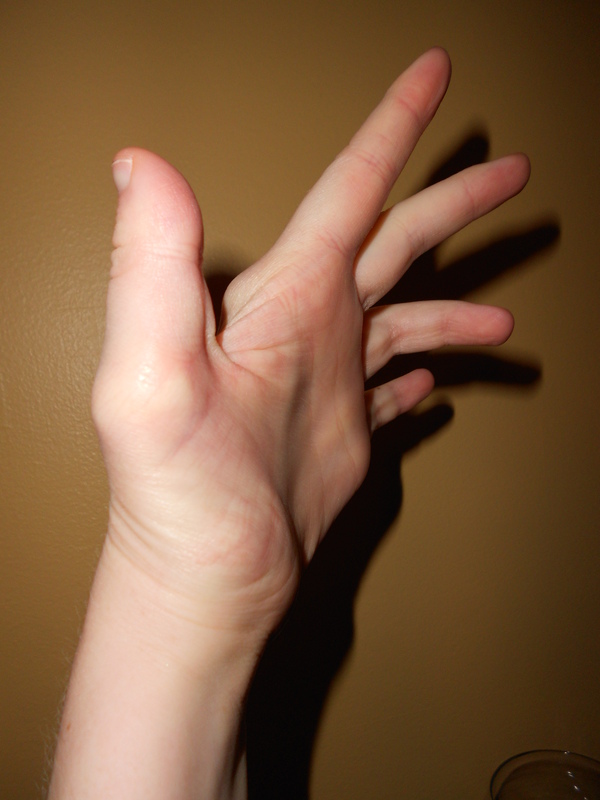 Although you cannot see it in the pictures, I would like to point out the best feature of my hands (both hands!!!) DOUBLE JOINTED FINGERS!!! A lot of my own accommodations for getting around to do things is being double jointed. For example: When I put on my earrings in the morning, I grip the back of my earring but I cannot hold onto it without using my double jointed thumb for more stability. The OT was taking measurements for different exercises and told me not to cheat, because I was using my double jointed moves. But it is hard to perform normally, because I have already found ways to accommodate living daily and so it seems normal to me until someone points it out. This is my right hand. I also have atrophy in the palms and numbness but my fingers don’t curve in yet. I was just taking this picture so you can see the atrophy in my thumbs. Both are like this, but my right hand is the worst. See the dip? That is where the muscle used to be. It started in my right hand when I was a sophomore in high school, but it was not until later college years that it started to get worse. Just a part of me now. It used to bug me, but I don’t notice it anymore. So, I have several strengthening exercises (both finger and hands) to do daily with a soft putty. It is in no way soft! It is quite the workout! 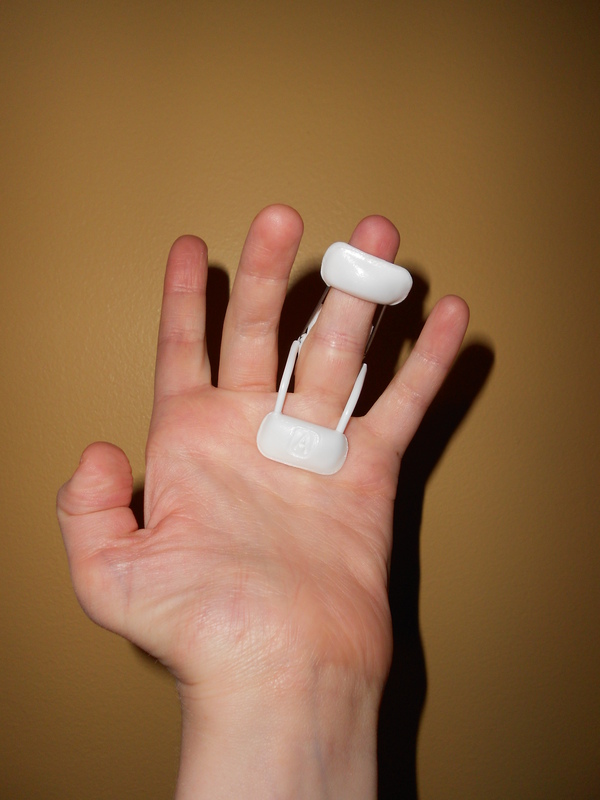 And also, I wear a splint on my left ring finger to help strengthen the muscles. I go back for another session August 29th. The best part of today was upgrading my phone. (finally!) It is just a simple T9 phone from Verizon. Nothing fancy, except the orange cover. It was that or black, but I figured orange would be good to find in case I drop it or lose it. Funny, the guy said the orange is labeled as “Hazard orange.” Guess it is a good fit for my phone. 🙂 The keys are a nice size and separated a tad so texting is smooth so far. I am thankful for that as that is a big part of my communication. I am still looking into a Captel landline phone as well. The MRI of the spine showed that the tumor growing on the inside of my spinal cord at the C3-C7 area has grown. Also, the tumor is producing fluid which is adding extra pressure on the spine. My parents have noticed me curving my shoulders more. I have always had bad posture since the surgery in 2002. But some days even more I can feel tightness and pressure so standing up straight is difficult anyway. I am to watch my breathing. Not being obsessed about it, but keeping watch if I ever find that it is hard to breath or having pain breathing…but the tumor is slow-growing so I just have to keep that in the back of my mind. Treating this tumor, I have a few options. I must be thinking and praying about these options before my next MRI on the spine only in October. There are two oral chemo pill options, a round of radiation (but unlikely), or have surgery to remove the tumor. Surgery is a last resort, but we also don’t want to wait until I have respiratory or diaphragm problems, so it is up in the air right now. I really have to sit down, write out the pros and cons, think and pray about the options and talk with my family…then talk with my doctor in October. I want to be prepared to discuss, because if there is an increase in size or more fluid, then action must take place. So, if you remember, please pray for me (my family and doctors) on this as it is important. I will say one thing though: God sure has blessed my physical body. My doctor said that he knows my case, but for some other doctor to come in…look at my MRI scans just from the spine, the first question he thinks they would ask is, “Can she walk?” The answer is yes. Sure my right ankle continues to curve in and weaken, but I can walk. I can even walk fast (my version of running), climb stairs, get up and down off the floor and chairs, lift things, stand on my feet for a week straight while painting, drive and so much more. My doctor emphasized that my MRI scans do not show who I am. Coming from him–after just discussing all the things that are going wrong, possible treatments and things to watch for…that meant a lot. More than he probably realizes. I think it was God’s way of saying, “My grace is sufficient for you. For my power is made perfect in [your] weakness.” (2 Corinthians 12:9a). I surely cannot do this without Him. You are one of the strongest women I’ve ever had the pleasure of knowing. And the fact that you find joy in the little things (double-jointed-ness 😉 is so inspiring to me! I feel so blessed to be a friend of yours and I will be popping a new letter to my pen pal in the next little while. I got a new address so look for the return sticker as it will be the new one. We are sending positive thoughts and prayers your way in hopes that you will have good results when you return on August 29 and I do like the sound of that new “hazardous orange” phone you got. Miss ya tons hun! Thanks Timmie for your words of encouragement and for taking the time to read all that! I will look forward to the letter when you can, cause I have a post card for you 😀 Yay for snail mail!!! 🙂 You and your mom have been a great support and I am so blessed by everyone’s thoughts and prayers. And the phone…it has proved to be great so far. I have even dropped it (on accident). All good to go, bonus it has a flashlight. 🙂 I discovered it last night as I was fiddling around with my phone in bed. Great way to see how bright it shines 🙂 LOL. You guys take care!